A vacuum cleaner is an essential part of any household's cleaning arsenal. And, with so many vacuums on the market today, there is a unit perfect for your home's specific cleaning needs – and for your budget. To help you make an informed vacuum purchase decision, our team did extensive research to find the best vacuums for six common categories, such as vacuums for pet owners, lightweight vacuums and vacuums for people with allergies. For each of our picks, we provide detailed information about key features, such as suction, filtration, ease of use and other things you should know before making a purchase. Read more about our methodology. The Shark Navigator Lift-Away Professional combines the functionality of an upright vacuum with the versatility of a canister. 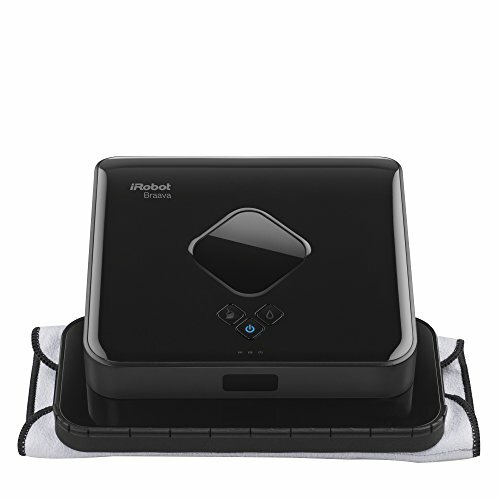 Its powerful suction rivals or exceeds high-end models from competing brands, and the included accessories provide even more flexibility to clean every room and surface. The latest entry in Bissell’s CleanView series incorporates the company’s new “OnePass” technology in a powerful machine that’s affordable for any household. This vacuum offers sturdy construction, a washable filter that saves money over time, and performance that far exceeds others in its price range. If you find yourself struggling with pet hair on your floor and furniture, this vacuum offers a powerful roller brush and easy-to-clean rubber pet attachments for furniture and upholstery. If most of your house has hard floors, you don’t necessarily need a vacuum with a powered roller brush. This easy-to-use canister vacuum has excellent suction on hardwood and tile floors, and no brush that sends debris flying across the room. If you live in an apartment, you may not need a large vacuum geared toward cleaning an entire house. This handy vacuum packs serious cleaning power and features into a lightweight package. For everyday spot cleaning or dealing with small messes, this small but powerful handheld vacuum offers long battery life and powerful suction, along with a versatile rotating nozzle to get to hard-to-reach areas. If you’re an allergy or asthma sufferer looking for relief, this newly-released vacuum offers superior filtration of allergens and microscopic particles, along with excellent maneuverability and all-around performance. This versatile wet/dry vacuum is loaded with useful accessories and a fully-removable filter system to quickly switch between uses. You can also use it as a blower to clear out dirt and debris. One important consideration when buying a vacuum is the type of floor you’re planning to clean with it. A powerful roller brush may be a key selling point if your house has carpeted floors throughout, while a home with mostly hardwood and tile floors may get more use out of a vacuum without a roller. A vacuum succeeds or fails based on its ability to pick up dirt, dust, and debris. When it comes to buying a vacuum, suction is the most important factor. Powerful suction allows vacuums to more efficiently clean up bigger messes, saving you time and effort. Along with suction power, filtration is an important factor: the best vacuums will remove fine particulates and allergens from your home while cleaning dust and dirt. Increasingly, vacuum manufacturers are abandoning vacuum bags in favor of removable containers that can be removed from the unit and emptied. While these containers are more economical than disposable bags, there are many models with containers that are difficult to remove and empty, which can lead to a dusty mess when it’s time to dispose of dirt and debris. Vacuums can widely range in price, from a simple $50 model to automated systems and high-end uprights that can cost well over $500. At the lower range, vacuums tend to be light on features and prone to failure after only a few months of use. Most high-quality vacuums tend to fall in the $150 to $500 range. These vacuums tend to be versatile and well-constructed, with a variety of special attachments and the ability to clean both hard and carpeted surfaces. 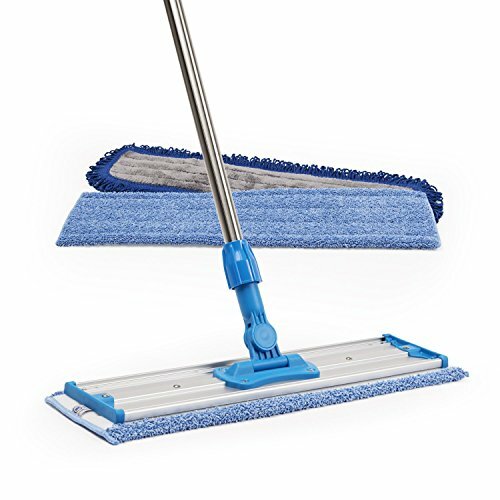 Many of them feature a roller brush to achieve a deeper clean on carpeted floors, and enough suction power for the majority of users. Vacuums at the higher end of the price range also offer powerful suction and versatile attachments, along with improvements to filtration and performance, but in many cases the extra cost does not have enough of a benefit to justify the added expense. For most homeowners, the Shark Navigator Lift-Away Professional delivers the best performance for the price. This is a powerhouse vacuum, with suction that far exceeds competitors in its price range—as well as competitors that cost twice as much. The unique design combines the portability of a canister vacuum with the performance of an upright, while included accessories like the “Dust-Away” hard floor attachment and pet power brush allow you to clean upholstery and various floor types. Powerful Suction. The NV356E offers a powerful motor that produces outstanding suction on both hard floors and carpets. This is a great vacuum when you’re looking for a deep clean, and the adjustable suction means you can easily adapt the vacuum for specific floors and uses. Great Maneuverability. The Shark Navigator Lift-Away Professional is very maneuverable, especially for a vacuum this powerful. The vacuum head is only a few inches wide, which allows it to fit into and clean tight spots around the house. Lift-Away Design. The ability to lift the canister away from its housing provides a lot of flexibility for above-the-floor cleaning. While the body of the vacuum may be a little too heavy to use it primarily as a canister vacuum, the ability to carry it with you definitely helps with reaching higher areas throughout the house. Excellent Filtration. With an integrated HEPA filter and Shark’s anti-allergen “Complete Seal” technology, the NV356E excels at trapping allergens along with dust and debris. The pre-motor filters and HEPA filter are both fully washable, which helps to extend the life of the vacuum and enhance performance. Top-Heavy Design. Because of its hybrid design, the NV356E tends to be relatively top-heavy. This weight, combined with the narrow vacuum head, gives the vacuum a tendency to fall over. Prone to Cord Tangling. The cord on the Shark Navigator Lift-Away Professional is one area where the design has room for improvement. While the 30-foot cord does give you a lot of reach, it tends to get tangled often while in operation. The Bissell CleanView Bagless Upright Vacuum with OnePass Technology is an excellent all-around choice, and its performance far exceeds its under-$100 price point. While the 1330 is similar to Bissell’s earlier 9595A model, the latest iteration of Bissell’s budget-friendly vacuum introduces a number of cosmetic changes and enhancements to cleaning power, suction, and durability. 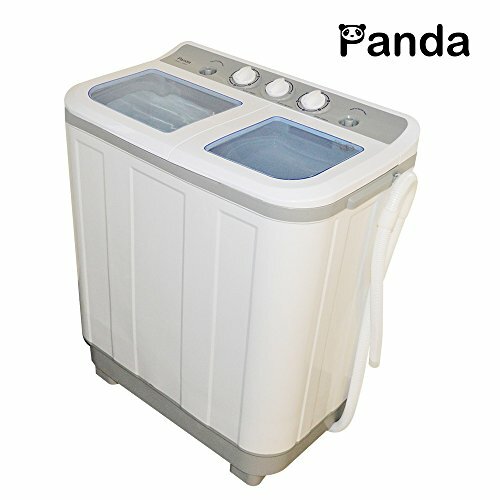 It maintains its predecessor’s large-capacity, easy-to-empty dirt tank, cyclonic suction technology, and multi-level filtration. One Pass Technology. The 1330’s main selling point is Bissell’s “One Pass” technology, which cleans floors without having to go over the same areas multiple times. This feature works very well, particularly on carpeted floors, and the updated brush roll on the 1330 really gets in to provide a deep, thorough clean. Excellent Design. The 1330 is a solidly-built machine that is packed with thoughtful design features. The “CleanView” dirt tank makes it easy to see when the vacuum needs to be emptied, and the tank easily opens using a latch at the bottom to prevent spills and extra messes during emptying. Cyclonic Suction. 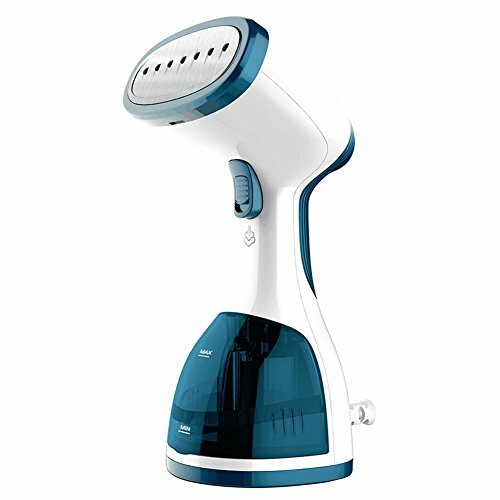 The 1330 offers a 10-amp motor and cyclonic technology to provide reliable and powerful suction. Combined with the outstanding performance of the roller brush, this vacuum is excellent at tackling tough household messes with no loss of suction. Better on Carpets. While the “OnePass” technology excels in cleaning carpets, it isn’t as great on hardwood and tile floors. In areas without carpets, the 1330 sometimes throws dirt and debris around, which can require added cleaning time and effort. Inconvenient Power Controls. For a vacuum that is mostly well designed, the power switch placement on the 1330 seems a little odd. Instead of being placed on the handle, the switch is about halfway up the body of the vacuum, which can be inconvenient. Cleaning a house filled with cats and dogs presents its own challenges, and many vacuums simply can’t handle large quantities of pet dander and debris. Vacuums specifically marketed toward pet owners are intended to tackle everyday pet messes without choking on clumps of hair or getting their roller brushes tangled up. The best of these pet vacuums offer rubber blades and brushes that are easy to clean, as well as accessories to clean furniture and upholstery where animals leave fur behind. The Hoover T-Series WindTunnel Pet Rewind Bagless Corded Upright Vacuum is packed with features to tackle pet hair and messes, but is not so specialized that it doesn’t work for everyday cleaning. While it does offer a wide array of tools to clean up after cats and dogs, it is also a solid all-around performer, with features like a headlight and automatic cord rewinder, that work in any home. Easy Pet Cleanup. The UH70210 excels at cleaning pet hair and other messes, and has an adjustable brush roll to adapt to multiple floor types and carpets. The powerful brush roll picks up pet hair in a single pass, and combines with powerful suction to remove hair that is deeply embedded in carpets and rugs. Automatic Cord Rewind. The automatic cord rewind feature of the UH70210 is very convenient: simply push a lever and the 25-foot cord retracts into the body of the vacuum, saving time winding and unwinding the cord and dealing with tangles. Pet-Specific Filtration System. The UH70210 features a filtration system that is specifically designed to remove pet-based allergens and odors from the house. A carbon filter specifically reduces pet odors, while a washable filter and HEPA filter remove allergens like pet dander from the air. Unwieldy Cord. While the automatic cord rewind feature saves time and effort, it is unfortunately placed in a spot on the vacuum that can make it difficult to maneuver around. You will most likely need to hold the cord while vacuuming to keep it out of the way. Mechanical Issues. 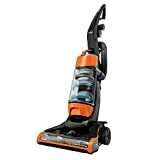 Many users have reported issues with the Hoover T-Series WindTunnel Pet Rewind Bagless Corded Upright Vacuum after a year of operation. While it’s not entirely clear whether this is a fault with the vacuum itself or an issue that arises from improper maintenance, it is something to consider when investing in a vacuum. If your floors are primarily hardwood or tile, you don’t necessarily need a vacuum with a powerful brush roll. In fact, an agitator may make cleaning these surfaces more difficult. A vacuum specifically designed for use on hard floors and area rugs will provide much better performance and cleaning power, and has fewer parts that are prone to failure, since there is no powered roller to attract long strands of hair. The Miele Classic C1 Olympus Canister Vacuum Cleaner is relatively expensive, but its canister design provides added versatility and portability, and the powerful motor effectively cleans hard floors and area rugs. 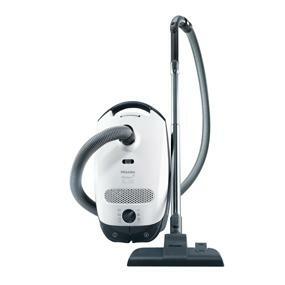 Miele’s products are known for their high-quality craftsmanship and durability, so the added price gives you a canister vacuum that excels at keeping hard surfaces clean and free of dirt. Ideal for Hardwood and Tile. The Miele Classic C1 is engineered for top performance on hardwood and tile floors. If most of the rooms in your home have wood or tile floors, this vacuum can save you a lot of time by eliminating the need to sweep floors before vacuuming. The long handle is particularly good at getting into hard-to-reach places. Powerful Motor. This vacuum has a powerful motor that provides steady, outstanding suction. Additionally, the motor offers adjustable speeds using a rotary dial, so it is easy to get more or less power whenever you need it. Lightweight and Portable. The canister design of the Miele Classic C1 makes it easy to carry the vacuum wherever you need it. At 12.9 pounds, it is significantly lighter than an upright vacuum, and has non-marking rubber wheels and a long, retractable cord to provide a 29.5-foot cleaning radius. Not for Carpets. Since this vacuum is designed primarily for hard floors and low-pile area rugs, it simply will not clean carpeted floors as well as a vacuum with a roller brush. If your house has a combination of floor types, you may prefer a more versatile vacuum. Premium Price. The Miele Classic C1 costs over $300, which is a price point that may simply be too high for many users. While Miele does make high-quality, long-lasting vacuums, the initial expense of purchasing this vacuum can be a deterrent. If you have a smaller home or are just looking for a light-duty vacuum for everyday spot cleaning, you will probably get more use and value from a lightweight model. While many vacuums in this category are “stick” style vacuums, there are also many compact uprights that balance cleaning power with a lightweight and space-saving design without sacrificing dirt capacity. While the UH20040 doesn’t offer as much power as a traditional upright vacuum, it’s very effective at cleaning small spaces. While it has a lightweight design that focuses on portability, it doesn’t sacrifice features: it offers multi-level filtration to trap dirt and allergens, cyclonic technology to deliver powerful suction, and a system check indicator to ensure consistent and reliable suction. Multi-cyclonic Suction. 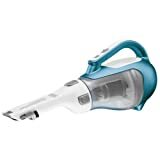 For a lightweight vacuum, the UH20040 has incredibly powerful suction. Incorporating a multi-cyclonic system and a 10-amp motor, this vacuum provides more than enough power to clean an entire apartment. Effective Filtration. In addition to its powerful suction, the UH20050 has the type of multi-level filtration system that you would typically see in a full-sized vacuum. These filters are fully washable and removable, so you can maintain excellent performance for much longer. Lightweight and Portable. The Sprint QuickVac weighs only 12.75 pounds, making it easy to carry from room-to-room. It also has a 23-foot cord, which is surprisingly long for a lightweight vacuum and lets you reach further without having to find a new plug. Messy to Empty. One major complaint with the UH20040 is that the dirt container can be tricky to empty. While it does empty through the bottom of the container, debris has a tendency to gather at the top, sometimes requiring you to dismantle the whole assembly. Brush Roll Isn’t Great for Hard Floors. Like many vacuums with a brush roll, the UH20040 can run into some issues on hard floors. The brush roll height is adjustable, but even at the lowest setting, some debris flies away from the machine. While you can use an upright or canister vacuum for whole-house cleaning, it can be a hassle to drag a full-sized vacuum out to pick up every mess. The latest handheld vacuums incorporate compact versions of technology you might find in a full-size vacuum, but offer greater flexibility and rechargeable batteries so you can pick up little messes wherever and whenever they occur. The Black + Decker CHV1410L 16V Cordless Lithium Hand Vac offers an ideal balance of functionality, flexibility, and convenience. It is very similar to Black + Decker’s other recent handheld models, but replaces the nickel-cadmium battery with a much more reliable and longer-lived lithium-ion battery. This allows for slightly more powerful and reliable performance, with more time between charges. Rotating Nozzle. The best part of the CHV1410L is the rotating nozzle: the ability to quickly change the nozzle position lets you get into more hard-to-reach spaces and clean up messes wherever they occur. Strong Suction. This hand vacuum has a surprisingly powerful motor with 15.2 watts of suction power. This makes it excel at tackling a very wide variety of messes without getting clogged or losing power. Long-Lasting Battery. The 16V lithium-ion battery is a big improvement over nickel-cadmium: it charges quickly, holds a charge for up to 18 months, and works for about four hours before needing a recharge. Awkward Charger. The one major drawback of the CHV1410L is that the charger can’t be mounted to a wall to keep the vacuum out of the way while it’s not in use. Instead, the charger has to sit on a table with the vacuum placed on top. If you suffer from severe allergies, you know the importance of a vacuum that removes allergens and filters the air. Many vacuums do offer some level of HEPA filtration to eliminate dust, mold, and spores as you clean, but some vacuums (and manufacturers) engineer vacuums specifically to eliminate allergens and purify the air. However, these specialized vacuums often come with a higher price tag. 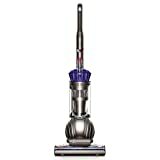 The Dyson Ball Multi Floor 2 Upright Vacuum is one of the latest model from Dyson, a company known for its high-performance vacuum cleaners. The company is very focused on allergy and asthma-friendly vacuums, using its own suction and filtration systems to eliminate allergens. The Ball Multi Floor 2 incorporates the same trademark technology in an easy-to-use vacuum that excels at filtering out dust, dander, and other common allergens. Certified Asthma and Allergy Friendly. Dyson’s vacuums incorporate a unique filtration system that pulls even microscopic particles from the air. For many allergy and asthma sufferers, this alone is the most important quality of the Multi Floor 2. Highly Maneuverable. Another common Dyson trait, the ball-based design, also makes its way into the Multi Floor 2. This results in a vacuum that can easily maneuver around tight corners to get every inch of every room clean, especially with the 31-foot cord. Works on All Floor Types. Another major selling point of the Multi Floor 2 is the automatic switch from carpeted to hardwood floors. Instead of having to press a button or a lever to switch from carpet to hardwood, the Dyson Ball Multi Floor 2 shifts automatically. Premium Price. Dyson vacuums are known for excellent performance, but they are also some of the most expensive available. The Multi Floor 2 costs about $400, which many buyers may view as too expensive. New to the Market. Because this model is so new, it is relatively untested. Dyson isn’t known for producing too many duds, but problems with the Multi Floor 2 may emerge as more buyers add it to their homes. Garages and workshops require an entirely different type of vacuum. Generally, the best shop and garage vacuums are rugged, heavy-duty machines designed to pick up debris that can include sawdust, plaster and drywall chunks, and even nails and screws. Additionally, most buyers want a shop vacuum that can handle both dry and wet messes, allowing them to clean a leaky basement or dusty workshop with one machine. The Shop-Vac 8-Gallon 5.5 Peak HP Stainless Steel Wet Dry Vacuum is a solid addition to your garage or workshop, although it suffers from some of the same shortcomings that accompany almost every wet/dry vacuum on the market. Its benefits outweigh its performance issues, however, since it is easy to switch between wet and dry applications and take on most common messes. Easy to Switch Between Wet and Dry Applications. 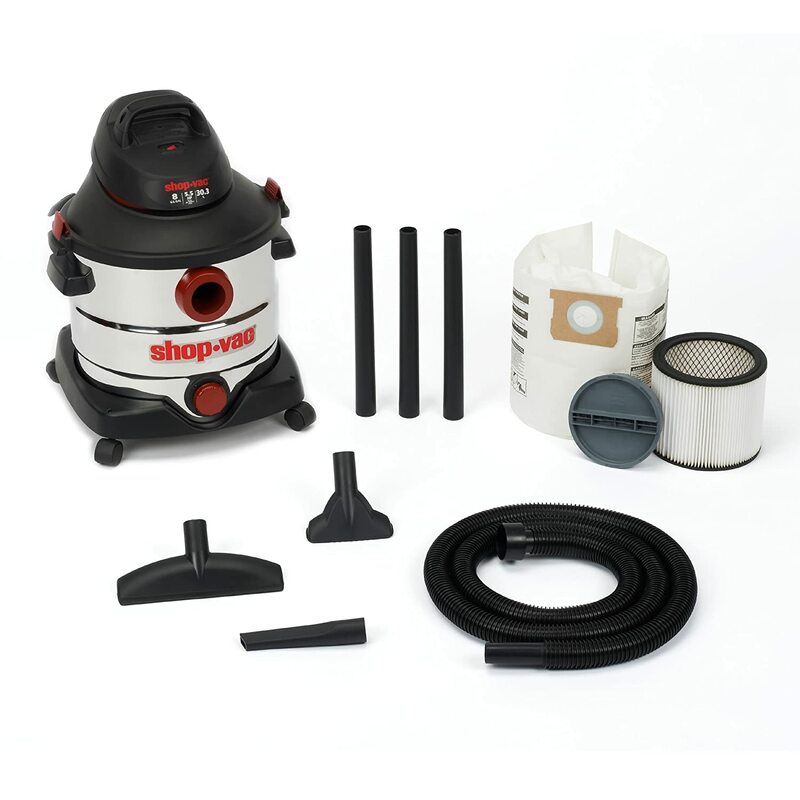 The filter system of the Shop-Vac 8-Gallon 5.5 Peak HP Stainless Steel Wet Dry Vacuum is completely removable, making it very simple to switch from cleaning up dry debris to cleaning spills and leaks around the garage and shop. Loaded with Accessories. This vacuum comes with a ton of accessories, including extension wands, multiple nozzles, and crevice tools. This provides a great deal of versatility right out of the box. Blower Feature. The removable hose can easily be affixed to the exhaust vent of this vacuum, allowing you to use the unit as a blower. This is a great feature for blowing debris out of a garage or off of a workbench. Loose Latches. The lid latches that hold this vacuum together are very loose, which can present some problems when you try to pick up the machine. Hose Diameter. With a hose diameter of 1.25 inches, the ShopVac may have trouble picking up larger debris, such as pieces of drywall, plaster or larger wood trimmings.